“Ice Age 4: Continental Drift” with a Simpsons short preview attached to the film when it opens on July 12 in cinemas nationwide. Ice Age’s latest chapter in one of the most successful film franchises of all time brings together the visually epic and the emotionally powerful; the humorous and the heartfelt – plus the world’s most beloved prehistoric squirrel and the ultimate unconventional herd of this or any Age. Interwoven with these epic tales of family exploits are the continuing adventures of Scrat, whose sole purpose in life – whose very existence – revolves around an acorn as elusive as it is cherished. Scrat’s quest for the nut has had consequences; in the first “Ice Age” Scrat’s obsession triggered the Ice Age itself. In ICE AGE: CONTINENTAL DRIFT, Scrat and the object of his pursuits are nothing less than the catalyst for a cataclysm. Forget what you’ve learned in geology about the continents forming as a result of massive tectonic turbulence and volcanic eruptions tearing land masses apart. ICE AGE: CONTINENTAL DRIFT reveals that these seismic shifts came about from Scrat’s misadventures. The film reunites us with Scrat as he’s going about his usual business: he has grabbed the acorn, set it down on the ground – and suddenly a mountain is torn apart and the earth itself opens up, separating land masses into the seven continents. Scrat hurtles toward the earth’s core, triggering massive earthquakes, which in turn isolates Manny, Diego and Sid from the rest of the herd. This continental size of adventure from the Ice Age pack and a short animated feature focused on Maggie Simpson come July 12 in cinemas will surely bring in loads of fun to families and all. “Ice Age 4: Continental Drift” is from 20th Century Fox to be available in 2D and 3D format to be distributed by Warner Bros. in Philippine cinemas. 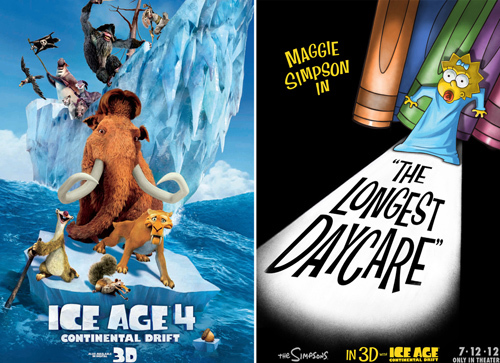 Check out 20th Century Fox (Philippines) in Facebook and 20thcenturyfoxph YouTube pages to watch the latest trailers of “Ice Age 4: Continental Drift” and a sneak peek at Maggie Simpson. Comments or suggestions about "Ice Age 4: Continental Drift with Simpsons short preview" is important to us, you may share it by using the comment box below.